Experienced in defending and challenging trial verdicts, as well as raising precedent-setting questions of constitutional and statutory law. Effective appellate advocacy requires skills different from those needed at the trial court level. Appellate attorneys often must distill a long and complex trial record into the most persuasive and understandable arguments and present them in just one brief and 20 short minutes of oral argument. Calfee’s litigators have extensive experience doing just that. We represent both appellants and appellees in state and federal courts of appeals. Our appellate experience includes defending and challenging trial verdicts, as well as raising precedent-setting questions of constitutional and statutory law. While appellate advocacy typically occurs following representation of a company’s interest at trial, clients also retain Calfee’s appellate litigators for the first time when a case is on appeal – either to educate other trial lawyers in the appellate process or simply to assume control of the appeal. We have, on multiple occasions, accepted cases following adverse results at a court of appeals, successfully argued that the Ohio Supreme Court should accept a discretionary appeal, and then won a reversal of the lower court decision. Regardless of whether we handled a client's matter in a lower court, we work to bring value to our appellate clients by efficiently and effectively presenting each case in the most persuasive manner in the appellate forum. 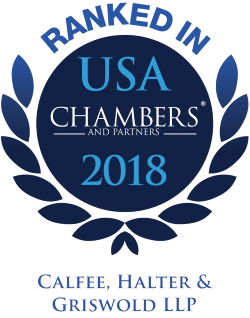 Calfee’s Litigation group was selected for inclusion in the 2019 "Best Law Firms" rankings by U.S.News –Best Lawyers in America in several Litigation practice areas.